ARTICLE: A Favorite Haunt...In 90 years, a place like the historic Colonial Fox Theatre can accumulate a lot of spirits, if you believe in that sort of thing. ARTICLE: Colonial Fox full of spooks...In 90 years a place like the historic Colonial Fox Theatre can accumulate a lot of spirits, if you believe in that sort of thing. ARTICLE: Colonial Fox Theatre plans paranormal tour... Paranormal exploration tours will be offered Oct. 30 of the 90-year-old Colonial Fox Theatre. ARTICLE: Theater to get profits from sale... Earl Wolfe and Patrick Williams like old movie theaters. They also share a passion for vintage electronic equipment. ARTICLE: Area events "Cult classic..." Colonial Fox Theatre Foundation will present its third annual showing of the “Rocky Horror Picture Show” in the space between the Colonial Fox Theatre and M&I Bank building on the outside wall of the historic theater. ARTICLE: Area events "Friday Flix"...The 2010 Friday Flix Series will continue with a showing of the animated film “Up” at dusk in the south M&I Bank parking lot on the outside wall of the historic Colonial Fox Theatre. ARTICLE: LOCAL BUSINESS BRIEFS "Corsini named president of historical association"
ARTICLE: RETURN ENGAGEMENT... Jonny Wood, Miami, Okla., describes himself as a normal factory worker, husband and dad. But he’s also hoping to make the world a little better with his music. ARTICLE: Area events...Friday, July 16 Friday Flix...The Friday Flix Series will continue with a showing of classic musical “Singin’ in the Rain” around 9 p.m. on the outside wall of the historic Colonial Fox Theatre. 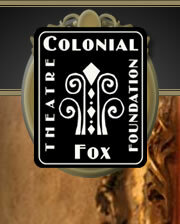 ARTICLE: Area events...Sunday, July 11 Theater tour...Colonial Fox Theatre will have a Second Sunday Theatre Tour from 2 to 4 p.m. ARTICLE: Area events...Friday Flix--The Friday Flix Series will continue with a showing of “Where the Wild Things Are” at 9 p.m. in the south M&I Bank parking lot, on the outside wall of the historic Colonial Fox Theatre. ARTICLE: Farmers Market to show ‘Food Inc.’ film tonight...Pittsburg Farmers Market will present an evening at the Colonial Fox Theatre Saturday at 407 N. Broadway in the south M&I Bank parking lot. ARTICLE: Colonia Fox Theater to resume tours Colonial Fox Theatre will resume its Second Sunday Theatre tours from 2 to 4 p.m. today. EVENT: Wichita Public Broadcasting Station does story on Colonial Fox – Sunflower Series. ARTICLE: Kansas Sampler snapshots...For those of traveling to Leavenworth anytime soon, be sure to try the New York Strip at Mama Mia’s and Annie’s Amber Ale at the High Noon Saloon … you can’t go wrong. EVENT: Second Annual Shamrock Festival and St. Paddy’s Parade.